As I blogged awhile ago, as far as Rich's and my engagement was concerned, it was all over but the shoutin'. Well ... the shoutin' has commenced! Behold, the Bauble. It was sweet, romantic and totally overwhelming! 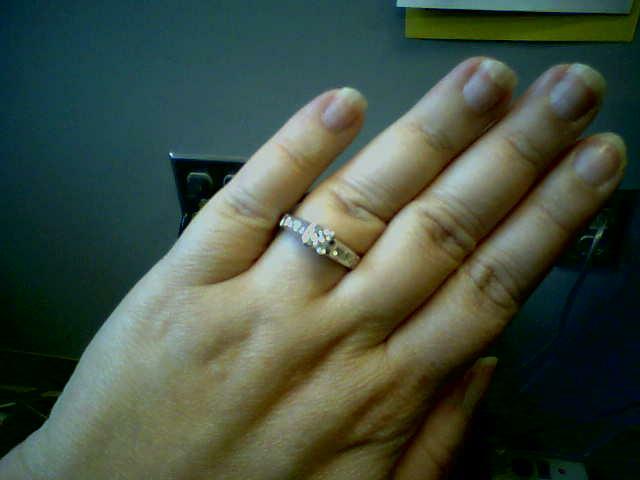 Today, I've enjoyed admiring my left hand and showing off the Bauble to coworkers, people in the elevator, and all of you wonderful GGB readers. Congratulations, Amy. This is great news.